Executive Chef Rob Gentile of acclaimed Canadian restaurants, Buca Osteria & Enoteca (King Street), Bar Buca and Buca Osteria & Bar (Yorkville) is known for his innovative, artisanal approach to Italian cuisine. Come and witness Chef Gentile as he showcases his unique approach to making Salumi di Mare (cured fish and seafood) a signature of the newest Buca outpost in Yorkville. Taste the final result of an intriguing interpretation of Italian coastal cuisine that that has captured the attention and praise of well-known critics. A first generation Canadian, born to Italian parents, Rob Gentile’s earliest memories are from his grandmother’s garden and kitchen, where he soon learned that food was what fascinated him most. When challenged by his mother at age 12 to choose a job that he could love forever, he inherently knew it would need to revolve around food. After working in restaurants from the age of 13, Rob entered George Brown’s Culinary School and joined the kitchen at Grazie in 1998. Soon after, he found his first role in a professional kitchen at North 44. After ten years working in Mark McEwan’s celebrated restaurants, Rob was ready for a new challenge. He was introduced to Peter Tsebelis and Gus Giazitzidis of King Street Food Company and joined them to take the helm of Buca. The restaurant opened in September of 2009 to rave reviews and soon became one of Canada’s most celebrated dining destinations, not to mention its most sought-after dinner reservations. In addition to his enthusiastic search for the exact ingredients needed for each recipe, Rob made his mark for his disciplined craft and innovative, artisanal approach to Italian cuisine. Regular trips to Italy continue to fuel inspiration and refine his skills in his family’s homeland. 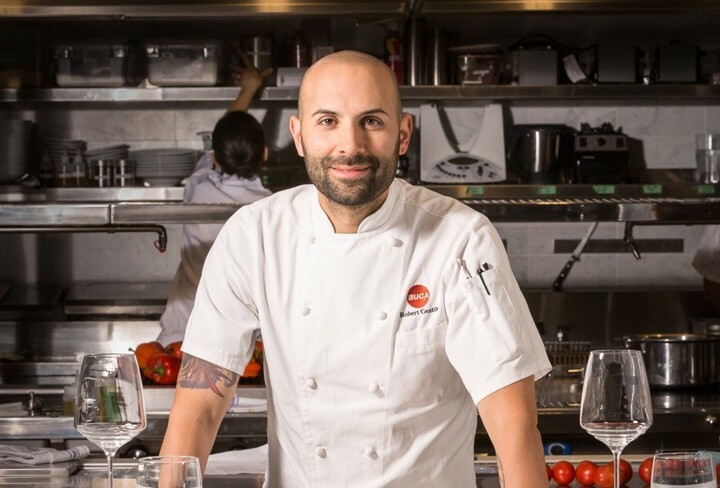 Diners and critics alike have taken note of his commitment to excellence and creativity, resulting in awards and accolades such as Toronto Life naming Buca Osteria & Bar (Yorkville) Toronto’s Best New Restaurant of 2015, and honours from Ontario Hostelry Institute with 2015’s Gold Award for Independent Restaurateur, as well as recent opportunities to cook with and earn the praise of culinary icons such as Alain Ducasse, Massimo Bottura, and Mario Battali. After success as Executive Chef at Buca (King Street), Bar Buca, Buca Osteria & Bar (Yorkville) and the soon to open Jamie’s Italian (Yorkdale), Rob still feels the passion for food he has had since childhood. This, coupled with a determined, detail-oriented and thoughtful approach to his craft, ensure there is much more to come in his culinary story.